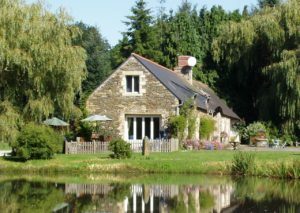 Lenvos nestles amid 15 acres of private grounds in the Blavet Valley in the Morbihan region of Brittany 5 minutes from the chateau town of Pontivy. The 16th century hamlet has been restored to provide five delightful holiday cottages surrounding a central courtyard. The cottages have traditional slate roofs, thick stone walls, beamed ceilings and still retains their ancient character. Despite this they offer all the benefits of 21st century fully equipped living. With two lakes, river frontage, woods and meadows, the grounds are a haven for a wide variety of native flora and fauna. Visitors can while the day away in the peaceful company of kingfishers, red squirrels and dragonflies. The lakes provide excellent wild fishing. The surrounding area offers the chance to get fully immersed in the gentle ways of French rural life. It is a remarkable oasis of peace and tranquility and yet just a short drive to shops, restaurants and numerous unspoilt villages. If you want to leave the car at home,the heated swimming pool, landscaped sun terraces, and children’s play area make Lenvos an ideal location for a memorable holiday for all ages. Lenvos is managed in a sustainable way. Woodland used for fuel is coppiced or replanted and new gardens have been made and contain a wide variety of plants and trees which enjoy the mild climate and moist soils of the river valley. In recognition of this, Lenvos has been awarded 1st Prize by South Brittany’s Tourist Office in both 2009, 2010, 2011 and 2014 and in 2017 a special award for Remarkable Gardens and Grounds .